Interislander is a road and rail ferry service across New Zealand's Cook Strait, between Wellington in the North Island and Picton in the South Island. It is owned and operated by state-owned rail operator KiwiRail. Three roll-on roll-off (RORO) vessels operate the 50 nautical miles (93 km; 58 mi) route, taking about three hours to complete the crossing. The inter-island rail ferry service began in August 1962 by the New Zealand Railways Department (NZR). The service primarily provided a RORO rail link between its North and South Island networks, allowing NZR to compete directly with coastal shipping companies for inter-island freight. 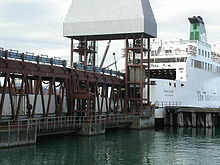 It also provided the first RORO road link between the two islands, which saw the Wellington to Picton ferries compete with, and then completely replace, the Union Company's Wellington–Lyttelton ferry service. Today, the Interislander service is still well patronised despite competition on the Wellington–Picton sea route with Bluebridge and from airlines, carrying around one million passengers and 230,000 vehicles per year on 5,500 sailings. In 2017, Interislander became part of The Great Journeys of New Zealand, a new tourism brand created by KiwiRail to unite their four scenic passenger services: Interislander, Northern Explorer, Coastal Pacific, TranzAlpine. Before 1962 the North Island and South Island rail networks were not connected, and the New Zealand Railways Department (NZR) struggled to compete with ships for inter-island transport. In the days before containerisation, rail freight between the islands had to be railed in a wagon to Wellington, unloaded and transferred onto a ship to Picton or Lyttelton, then loaded into another wagon before being railed the rest of the way. The Union Steam Ship Company (USSC) ran an overnight ferry between Lyttelton and Wellington using steamers. NZR also contracted SAFE Air to run its "Rail Air" airfreight service for freight between the islands, from Paraparaumu to Blenheim, but this was limited to aircraft payloads. The decision to start a rail ferry was made in 1958 by the Cook Strait Transport Enquiry Committee. The enquiry was set up following Union Steam Ship's decision to withdraw the unprofitable Tamahine, built in 1925. It appears NZR was officially reluctant to compete with USSC for inter-island traffic, but supplied the New Zealand Railway Officers' Institute with information to put to the enquiry. GMV Aramoana was the first ferry to enter service. The Cook Strait Inter-Island Rail and Road Service (as it was known) started on 11 August 1962 with the roll-on roll-off ferry GMV Aramoana. The service dramatically increased efficiency, since freight could stay in the same wagon the whole journey, reducing time and money. Aramoana took just 3 hours 20 minutes to cross Cook Strait, dramatically decreasing time between the two islands for cars and passengers - Wellington to Christchurch travel time was reduced from 11 hours on the Union ferry to 9 hours by Railways ferry and road. The initial service was one sailing each way per day, Wellington to Picton in the morning and Picton to Wellington in the afternoon. The new service led to the decline of NZR's Rail Air service, which saw a dramatic drop in airfreight. The service was an immediate success, although it was criticised for high prices. At NZ£ 9 10s one way for a family of four and a car up to 4.04 m (equal to NZ$395 in 2016 dollars,) many people thought the service was overpriced for a Railways-operated service. However, there was a fine line to tread when it came to setting the price - too low, and shipping companies and airlines would claim unfair competition. Nevertheless, it was a cash cow for the Railways - in the 1963/64 financial year, it contributed £535,000 of the Railways' £538,500 working profit. The service expanded with the addition of Aranui in 1966, MV Arahanga in 1972 and Aratika in 1974. The Union Company responded to the competition by converting TEV Maori to take roll-on roll-off (RORO) road traffic and ordering a new RORO ship, TEV Wahine. However, the resurgence was short-lived: on 10 April 1968, Wahine foundered at the entrance to Wellington Harbour during a storm, resulting in 53 deaths. By the time replacement ship TEV Rangatira entered service in 1972, competition from the Cook Strait ferries and increased competition from air travel, especially following the National Airways Corporation's introduction of the Boeing 737 in 1968, saw the Wellington-Lyttelton service become uneconomic. The Union Company withdrew in 1974, and after two years under the Ministry of Transport, the service was cancelled in September 1976. In 1982 Arahura joined the fleet to replace the ageing Aramoana and Aranui. The faster Arahura reduced the time across Cook Strait by 20 minutes to three hours. When the New Zealand Railways Corporation (the successor to the Railways Department) was restructured in 1982, the service was renamed "SeaRail". In 1989, it was renamed the Interisland Line, and the service became known as The Interislander. The fleet was upgraded with improved facilities and a new livery including Pelorus Jack. In 1991, New Zealand Rail Ltd, including the Interisland Line, was spun off from the Railways Corporation. In 1993, New Zealand Rail Ltd was privatised and became Tranz Rail in 1995. In 1999, Tranz Rail leased DEV Aratere, and between 1999 and 2001 disposed of Arahanga and the Aratika. In 2004, Toll NZ bought out Tranz Rail, and the Interisland Line was renamed the Interislander. Both ships were repainted in a new livery, with a fern replacing Pelorus Jack on the funnel - he moved to the hull with the logo. In 2005, Toll leased Challenger, which in 2007 was renamed MV Kaitaki. Kaitaki was the first Interislander ferry without a rail deck, and the first with a bow door (all the other ferries were stern boarding). On 1 July 2008 the New Zealand Government purchased Toll NZ Ltd, including Interislander, becoming part of KiwiRail. In 2011 Aratere was significantly lengthened by adding a 30-metre midsection to increase her capacity. In November 2012, Interislander staff threatened strike action over the upcoming Christmas period, demanding better wages. Owner KiwiRail responded with a lock-out notice. Freight company Mainfreight slammed the union's actions as "bloody disruptive". In November 2013, Aratere snapped a drive shaft and lost a propeller in the Cook Strait. Interislander chartered MS Stena Alegra to help with the peak summer period while Aratere was under repair. In December 2014, it was announced Stena Alegra would be chartered long-term to replace the ageing Arahura. Arahura last sailed on 29 July 2015, and the Stena Alegra, refurbished and renamed Kaiarahi, entered service in September 2015. The Lynx was the Interislander's fast ferry service across Cook Strait. Pressured by Christchurch businessman Brooke McKenzie and his ill-fated Sea Shuttles NZ fast ferry service, the Interisland Line chartered the HSC Condor 10 to operate a fast service across the strait for the 1994/95 summer. The "Vomit Comet", as it was sometimes dubbed, was an initial success, taking half the time of the regular Interislander ferries. Condor 10 returned to serve as The Lynx every summer until 1999, when it was replaced by the HSC Condor Vitesse for the 1999/2000 summer. A year-round service was started in 2000 with HSC Normandie Express, which was replaced in 2003 by HSC Incat 046. The Lynx was cancelled in 2005 due to large losses. The fast ferries use copious amounts of fuel and their jet streams caused environmental damage. In 1994, speed restrictions were imposed in Wellington harbour to reduce wash and protect ships berthed at Aotea Quay, and in May 2000 an 18-knot speed limit was imposed on all ships in the Marlborough Sounds after residents complained of shoreline damage caused by the ferries. By 2002, The Lynx took 2 hours 15 minutes to complete its journey. This was only a 45-minute advantage over the Arahura and Aratere, which had the advantage of being able to operate in swells above The Lynx's limit of 4.0metres, which were common in Cook Strait and frequently caused cancellations. Rail vehicles at the Wellington terminal. Both Arahura (pictured and now retired) and Aratere are capable of loading and unloading road and rail vehicles simultaneously using a double linkspan. The Interislander operates three roll-on roll-off ferries: Aratere, Kaiarahi and Kaitaki. Aratere is a rail ferry, carrying rail wagons on the lower vehicle deck and road vehicles on the upper vehicle deck. Kaitaki and Kaiarahi do not have rail capacity, and carry road vehicles across two decks. The ship names are all in Māori, and translate to "Quick path" (Aratere), leader (Kaiarahi) and "Challenger" (Kaitaki). DEV Aratere 1998 1999 17,816 600 Numbers are post 2011 modifications. MV Aratika 1974 1974–99 9,035 840 Originally freight only; converted to passenger use in 1976. HSC Incat 046 1997 2002–03 5,707 762 also known as the "Devil Cat"
^ "The Journey - Interislander". ^ "Kiwirail 2010-2011 Annual Report" (PDF). ^ "KiwiRail launches the Great Journeys of New Zealand at TRENZ 2017". Scoop Independent News. ^ a b c "'The floating bridge' - Cook Strait ferries". New Zealand History online. Retrieved 21 August 2011. ^ Leitch & Stott 1988, p. 153. ^ "Interislander 50th Edition". Issuu. Retrieved 23 December 2018. ^ a b Hurst, Tony (April 2018). "Main North Line". Railway Observer. 348: 5. ^ "TAMAHINE ARRIVES, EVENING POST". paperspast.natlib.govt.nz. 16 December 1925. Retrieved 23 December 2018. ^ Bromby 2003, p. 152. ^ "Drive inter-island brochure - nzhistory.net.nz". Retrieved 21 November 2010. The fares have been corrected for 1962, when the New Zealand pound was still in use. ^ "New Zealand CPI Inflation Calculator - Reserve Bank of New Zealand". Retrieved 16 November 2016. ^ "Wellington Ferry Service Ends - nzhistory.net.nz". Retrieved 12 January 2012. ^ "Interislander strike rests on new vote". 3 News NZ. 27 November 2012. ^ "Interislander strike talks continue". 3 News NZ. 26 November 2012. ^ "Mainfreight condemns Interislander strike". 3 News NZ. 23 November 2012. ^ "The "Vomit Comets" - Fast ferries on Cook Strait - NZHistory.net.nz". Retrieved 21 November 2010. Bromby, Robin (2003). Rails that built a Nation: An Encyclopaedia of New Zealand Railways. Wellington: Grantham House. ISBN 1-86934-080-9. This page was last edited on 14 March 2019, at 22:51 (UTC).